Laura drove me to a part of town that I hadn’t visited on foot earlier that day. We had a little bit of daylight left and Laura took us to two historic places. The first was, in its heyday, an amazing and architecturally amazing bullring called Plaza de Toros Real de San Carlos. 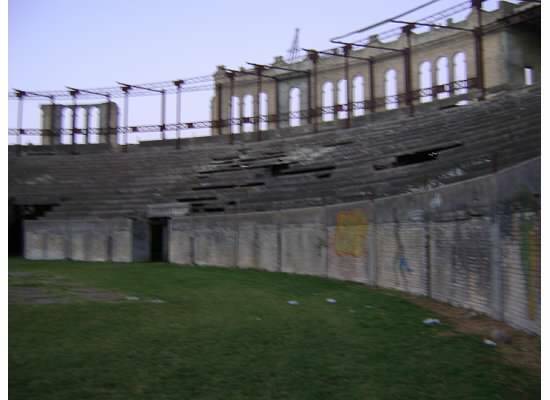 Unfortunately, the Plaza de Toros is no longer in use … as anything. It is such a shame because if someone had the money to restore it, it would be quite an amazing place/concert venue/museum. It’s quite run down and if there were safety codes, I’m sure it would fail all of them. As we walked under the stadium seating to enter the center of the bullring, Laura warned us to watch for loose and falling stones. Along with the warning signs outside of the stadium, when I Googled the stadium later I also learned that Wikipedia states that it is forbidden to enter the bullring. It was well worth the risk. It was gorgeous inside and if you can use your imagination to picture this place in all its glory, it must have been incredible. The center of the ring was full of grass that wasn’t too overgrown – which leads me to believe that someone must be caring for the property. There was also a fair amount of graffiti all over the stadium walls that a good scrubbing should be able to remove. 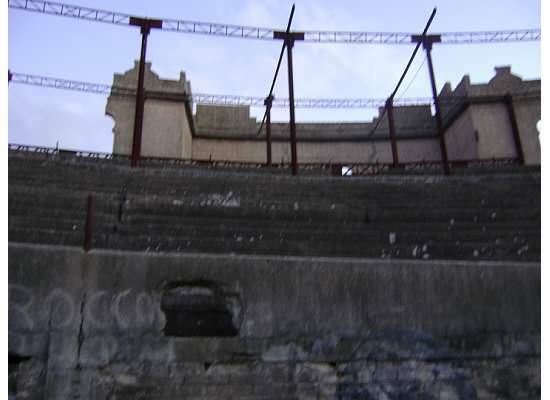 If it were to be restored, I think that it could be turned into an amazing concert arena. There is no shortage of seating, the stone work is beautiful and the acoustics are stellar. I wish I had an audio recorder!